When it comes to leading-edge processing technology for yarn feeding, control systems and lubrication technology for knitting machines, Memminger Iro is considered to be one of the leading companies in the market. PJ ELF is the latest development of the well know UNIWAVE spray lubricators. "Due to a brand new technology the air consumption of the new PJ ELF is 30-50% lower than existing spray oilers on the market. This leads to a tremendous reduction of maintenance cost, Memminger Iro says. Special nozzles reduce oil fog in the knitting room to a minimum and the focus is on easy handling combined with integrating many function control devices such as pressure switch and relief valve. MIS checks before the knitting cycle if all necessary yarns are present. Otherwise the knitting cycle cannot be started. Iro Memminger says this results in a dramatic increase of the machine efficiency and costs which rise in connection with material wastage are reduced dramatically. The sensor has very fast reaction times and can therefore also be used to monitor small patterns. Control rows at and the end of the knitting cycle are said to be no longer necessary. The Navigator is a modular system designed to run a large diameter knitting machines. 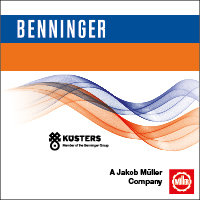 According to customer demand Memminger Iro can supply only the controller and distribution board as the minimum configuration as well as the complete set which incorporates additionally all cables, push buttons, inverter, power unit and other parts. Quick installation through "plug and play"
Integrated connection of several Memminger Iro products e.g. lubricator, fabric scanner, yarn consumption control unit, motor drive belt system and others. The machine controller can be installed on any large diameter circular knitting machine. If all machines in a knitting room are equipped with this kind of machine controller, it is very convenient for the knitting machine operator due to only having one system instead of several different..
MNC 2 detects broken or bent needles at large diameter circular knitting machines. The system can be adapted on machines up to gauge 44 respectively speed factor 1.500. It supports a lot the reduction of second grade fabric because the optical sensor stops the machine immediately in case of broken or bent needle.